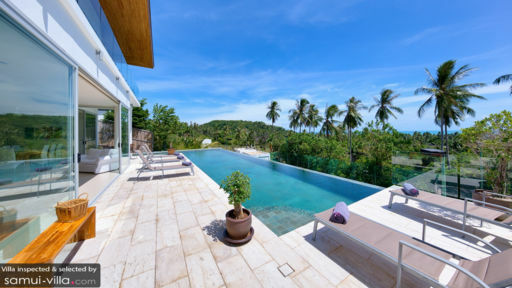 Villa Zoe is perched atop the hills of Bang Po bay, along the serene northern coasts of Koh Samui. Three bedroom Villa Zoe share the grounds with a collection of four and six bedroom villas. 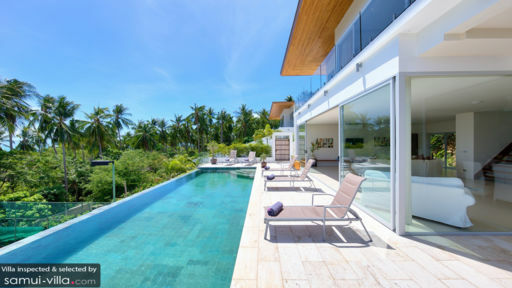 Each villa features a pool and garden in its private compound, and boasts living spaces that are ultra-chic and sleek. A total of six guests are accommodated in three bedrooms. You’ll be greeted with vistas of the ocean and rugged coastlines from each of the three bedrooms. Don’t miss the magical sunset show in the evening; we recommend taking in the views from the breezy balcony. Each room is elegantly appointed, featuring modern homeware and soothing cream hues. Amenities common to all bedroom include air conditioners, king beds, mood lighting and private en suites. Hair dryers, robes and slippers are provided. Baby cots are available at request, while foldaway beds are put up at additional costs. An L-shaped infinity pool takes center stage in the outdoor compound. The turquoise waters sparkle under the sun, tempting vacationers into taking dips in the pool through the day. Young travellers aren’t left out of the fun; features like a wading area makes it a child-friendly facility that your little ones can enjoy. Loungers laid out around the pool invite sun seekers to sit back, relax and take in the incredible views out to Koh Phangan and the Angthong Marine Park. A gas barbecue grill is available for travellers who enjoy grilled delicacies and outdoor parties. Throwing a pool bash? Set the mood right with ambient lighting, and by playing your favourite songs through the iPod music system. 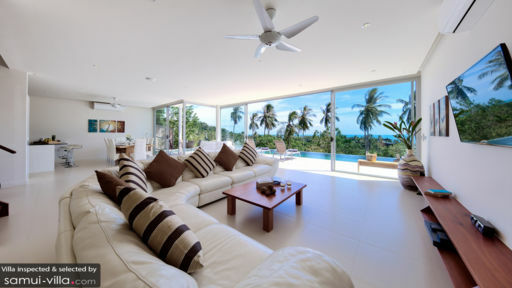 Air conditioners and ceiling fans keep the open plan living spaces of Villa Zoe cool and breezy. The look here is minimalist chic, with white and off-white hues and contemporary pieces. A selection of colourful homeware and artworks enliven the living area, and the floor-to-ceiling glass folding doors let in plenty of sunlight to create well-lit interiors. An LCD flat screen satellite TV and iPod sound system provides entertainment. When it’s time for dinner, choose between enjoying your meals indoors at the eight seater dining set, or outdoors at the terrace. Highchairs are available for young guests in your travelling party. Right behind the indoor dining area lies an open kitchen and breakfast bar. Housekeeping services, security service and a daily breakfast service are included with your stay. A baby cot and high chair are available for use free of charge. Amenities available at additional cost include personal guest services, laundry service, in-villa massages, airport transfers, personal driver service, car rental and child minding services. Unlike bustling attractions like Chaweng and Lamai beaches, the vibes at Bang Po beach are quiet and relaxed. The pristine shores are dotted with dining establishments (try Krua Bang Po restaurant for Thai fare or Spanish tapas at Vela Beach Lounge), and the calm, shallow waters, with its colourful marine life and shallow coral reefs makes the beach an excellent snorkeling site. But you’re never too far away from the fun and action. Vibrant Chaweng is a 20-minute drive from Bang Po, and the charming Bophut is a quick 10-minute ride away.